Bioscope is a word with many meanings (which is why it was chosen for the title of this blog). Bioscope can mean a view of life (its original dictionary definition), a cinematograph camera, a projector, a fairground film show, a cinema, a make of microscope, a film trade journal, and a science-based visitor attraction in France. The term was commonly used for a place to see films in the early years of the twentieth-century, and that term persisted in some countries, notably India and South Africa. What I hadn’t know before now is that it also also adopted in Tibet – albeit in the local pronunciation, beskop. I have just come across two detailed and fascinating articles on the history of film in Tibet, ‘The Happy Light Bioscope Theatre & Other Stories’, written by Jamyang Norbu for the Tibetan news website Pahyul.com. Part one is here, and part two is here. It can also be read on Jamyang’s Shadow Tibet blog. He has quite a story to tell. Film had come to Tibet by 1920. Jamyang tells us that when the “first (invited) British mission reached Lhasa” the head of the mission, Charles Bell, was entertained by Tsarong Dasang Dadul, commander-in-chief of the Tibetan army, with some film shows held in his private screening room. Tsarong operated the projector himself. Jamyang doesn’t say what the films were, but reasons that it was probably one of only two projectors in Tibet. The Dalai Lama is likely to have had the other one. In Lhasa, Charlie Chaplin was the great favourite; we had one of his films called The Adventurer, in which he played an escaped convict. The Tibetans renamed this film ‘Kuma’ (The Thief) and everyone wanted to see, including His Holiness, who laughed heartily throughout the performance. Tibetans called Chaplin ‘Chumping’, from Charlie the Champion, the word entering the language. Rin Tin Tin was another great favourite. The cinema came to be known as beskop, adapted from bioscope, though now Tibetans use the term ‘lok-nyen’, a translation of the Chinese ‘dian-ying’ (electric shadows). Jamyang stresses that there is little evidence of Tibetans having viewed the cinema superstitously. The first cinema in Lhasa may have opened before 1934, managed by two Muslim brothers named Radhu, Muhammad Ashgar and Sirajuddin, though the details are uncertain. It seated around a hundred, with a balcony for twenty or thirty paying higher prices, from which a Muslim translator would narrate the story to the Tibetan audience. Monks were amongst the most ardent of our cinema clientele. There is nothing which Tibetans like better than to see themselves and their acquaintances in a frame or on the screen. Gould was among those who supplied that need, because as well as bringing projectors with them the British brought cine cameras. The first film shot in Tibet was probably film taken by J.B.N. Noel, cinematographer with the 1922 British Everest exhibition, whose footage is included in the documentary feature Climbing Mt Everest (1922). It is included in a new BFI National Archive touring programme, The Search for Shangri-La: Tibet on Film 1922-1950. The bulk of the programme is (silent) home movie footage shot by British missions and explorers iin the 1920s, ’30s and ’40s. They include the botanist George Sherriff, the aforementioned Frederick Bailey and the Williamsons, Charls Bell (on his return to Tibet in 1934) and Sir Basil Gould, who brought a cameraman with him to Lhasa, Frederick Spencer Chapman. These films feature ceremonies, landscapes and Tibetan flora and fauna. Shot for the most part in colour they form an extraordinary archive of Tibetan life before the Chinese takeover, and were used in the 2008 BBC television series The Lost World of Tibet (now available on DVD). 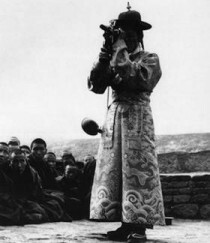 The first Tibetan filmmaker may have been Tsarong Dasang Dadul, who acquired a camera at some time after the projector with which he entertained Charles Bell in 1920. Actuality films were made by Tsarong’s son Dundul Namgyal, while Tsarong himself filmed Anglo-Tibetan football matches outside Lhasa in 1936. Heinrich Harrer reports that the young 14th Dalai Lama was a keen filmmaker and knew how to dismantle a projector and put it back together again. Jamyang Norbu writes that another filmmaker in the 1940s was Tibetan official Jigme Taring (shown at the top of this post) who filmed festivals and street life in Lhasa, and the 14th Dalai Lama’s official tour of Sera, Drepung and Ganden. Jamyang goes to to write about films and cinema exhibition following the Chinese occupation, including Tibetan fiction films (the first is believed to have been made in the mid-1970s). He also writes about his personal experience of exhibiting world cinema classics to Tibetan students in the 1980s, including Nosferatu (1922). It’s a fascinating history, showing how film was not just the harbinger of modernity for Tibet but how it fitted into (and documented) established traditions. Film was never simply about the shock of the new; it complemented the old as well, and was shaped by every society that encountered it. The Search for Shangri-La tours Britain until May 2010 – details of screenings are here; while the Everest films of J.B.L. Noel will feature at this year’s British Silent Film Festival in April.